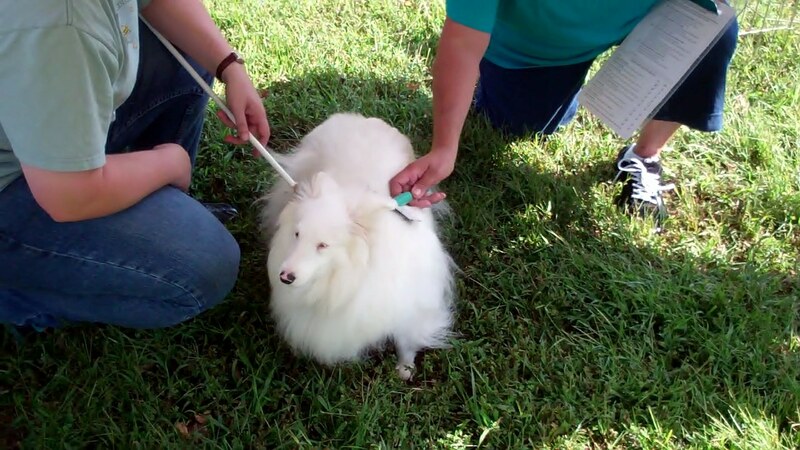 In this article, I will be referring to exercises required for the AKC (American Kennel Club) Canine Good Citizen evaluation. The rules and more information about this activity can be found by contacting the AKC or searching their website. This article is not meant to give you all the rules for the evaluation, but is meant as a guide to assist you with teaching your blind and deaf dog the exercises and when taking the evaluation. It’s a good idea to take a few minutes prior to the test to speak with the evaluator about any modifications that your particular dog needs to be successful. 1. Accepting a friendly stranger. Your dog should remain by your side while a person approaches you, shakes your hand and spends a minute or two talking to you. Your dog can sniff the person, but should not be jumping on them, tangling them in the leash, or acting afraid. This one probably doesn’t require any special modifications to evaluate. You can easily practice this one when you are out for a walk, or when guests come to your home. As people stop to ask you about your dog, reinforce your dog for calm behavior.